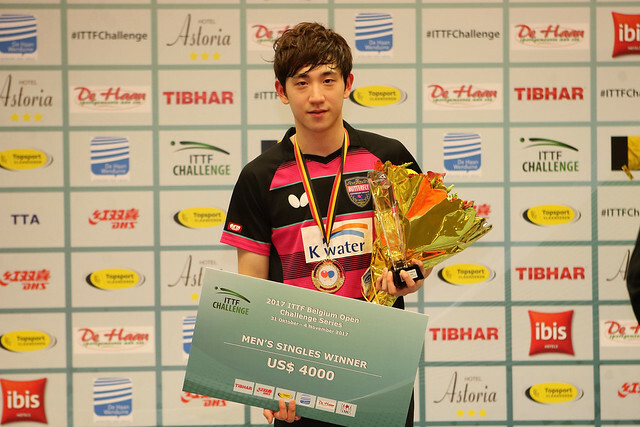 Winner of the Men’s Singles title on the ITTF World Tour in 2014 in Croatia, Ricardo Walther upheld German pride on the evening of Friday 3rd November in the West Flanders coastal resort of De Haan. At the quarter-final stage of the Men’s Singles event at the 2017 ITTF Challenge Belgium Open, the no.2 seed, he justified his exalted position in the competition by beating India’s Sanil Shetty to reserve his place in the penultimate round. He emerged successful in five games (11-7, 11-3, 5-11, 11-7, 11-6). Three years ago when he emerged successful in the Croatian city, he accounted for Misaki Yoshida in the final; if he is to repeat the success in De Haan, he will have to do the same again, he will have to beat a Japanese adversary. In the opposite half of the draw, the staggering progress of both 16 year old Yukiya Yuda and 18 year Masaki Takami continued. Masaki Takami accounted for Sweden’s Simon Ardvisson (6-11, 11-6, 11-7, 9-11, 11-6, 11-4). No disrespect to Simon Ardvisson, who in the same year as Ricardo Walther won in Zagreb was the runner up in De Haan, beaten by Vladimir Samsonov of Belarus in the final, but his defeat was only back page news. The front page belonged to Yukiya Uda, he accounted for Patrick Franziska, the no.5 seed and the player who had been integral to German success at the recent Liebherr 2017 European Team Championships; Yukiya Uda won in six games (6-11, 11-6, 11-7, 9-11, 11-6, 11-4). Yukiya Uda versus Masaki Takami in the penultimate round; in the opposite half of the draw Ricardo Walther faces Korea’s Kim Donghyun, the no.8 seed, in the round of the last eight he recovered from a two games to nil deficit to beat Slovenia’s Darko Jorgic, the no.20 seed (9-11, 6-11, 11-9, 11-5, 11-8, 8-11, 11-6). Now could the Japanese camp be hoping for a Ricardo Walther win even though he is the higher rated player? In the third round Masaki Tokami beat Benedikt Duda, one round later Yukiya Uda accounted for Patrick Franziska, seems they have a liking for Germany opponents; not good news for Ricardo Walther!